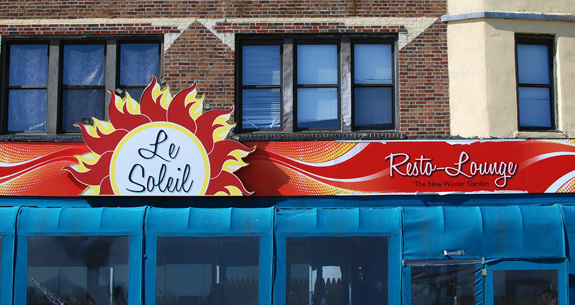 I continue my exploration of the Brighton Beach boardwalk with a visit to Le Soleil, formerly know as Winter Garden — a 180 degree turn of sorts, since soleil means sun in French. 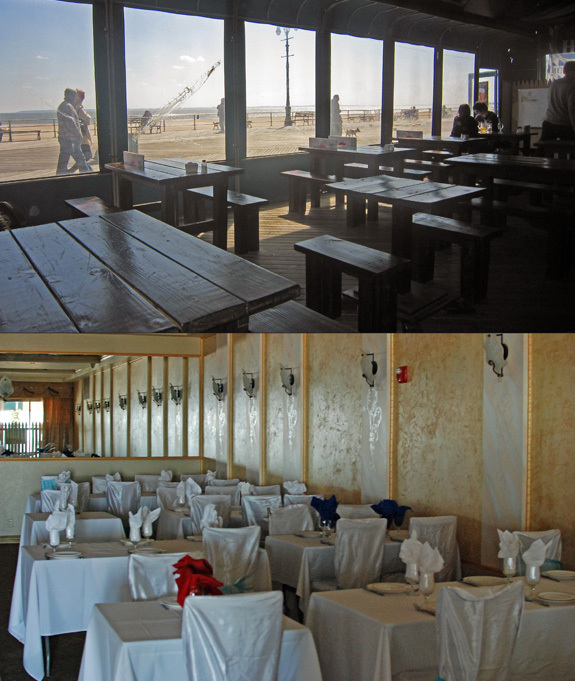 I’d never been to the old Winter Garden, but the new incarnation is a curious mix: the outdoor porch area is filled with casual wooden tables and booths, while inside there’s the usual pseudo-classy Brighton Beach Russian dining room with pompous white tablecloths and chair slipcovers. You’ll also find a stage, a lounge area and a separate banquet room, just to provide something for everyone. 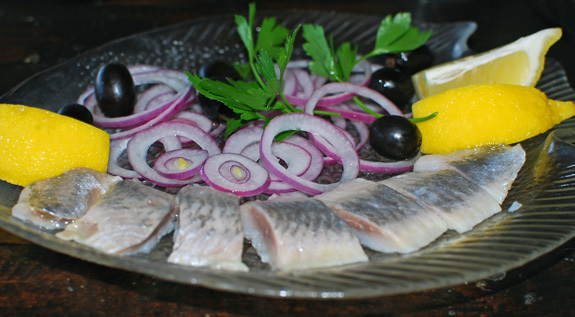 With its shrimp cocktail, grilled branzino and burgers, the almost reasonably sized menu could trick you into believing you’re not in a Russian restaurant. Certain signs don’t lie, though, such as the pervasive potato dishes, the numerous salads, or the kebab section. 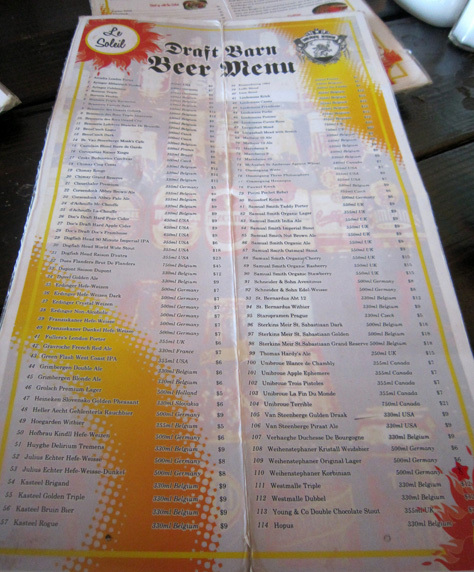 Beer lovers are offered no less than 114 options, and indeed the food seems to have been chosen partly with beer in mind. Oh, and in addition to Le Soleil and The New Winter Garden, the restaurant (or just the outdoor section, who knows…) boasts a third name, Draft Barn. 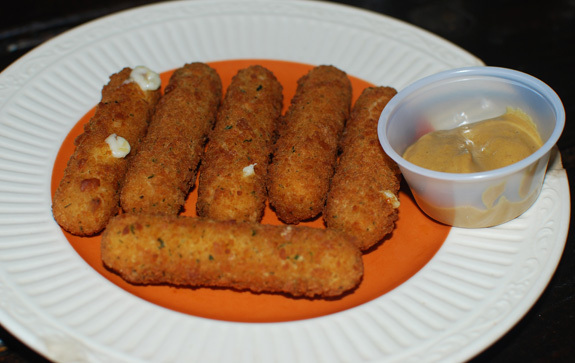 We chose to start with some non-Russian appetizers such as the mozzarella sticks (some sarcastic individuals might say that a dish that is both fried and made with lots of cheese has to be partly Russian). Nothing to write home about here, the whole dish was pretty bland, like only American industrial cheeses can be. 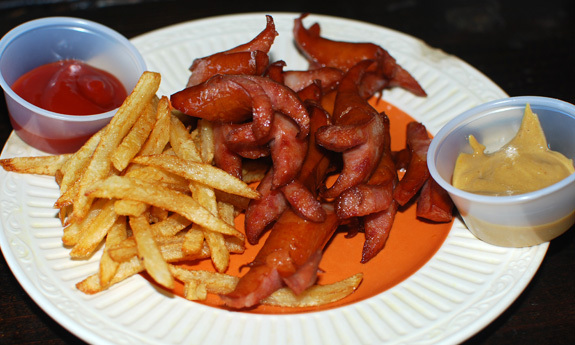 If seeing “Hunter’s Bites” on the menu fills your head with images of bold hunters in fur hats looking for wild boar or bear in the cold, snowy Siberian forests, prepare yourself to be disappointed: you’ll merely be getting chopped fried frankfurter with fries. That’s right, an appetizer served with fries — like all the entrées, apparently. The frank was OK, but the fries weren’t crispy. 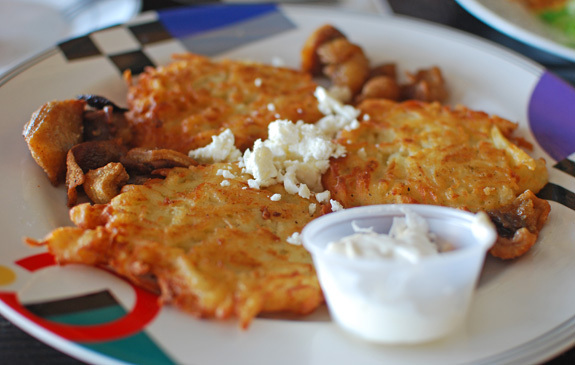 The potato pancakes, served with fried bacon bits and goat cheese, were good without being remarkable. Save for the kebabs (and the burgers) the entrées are heavy on pork. 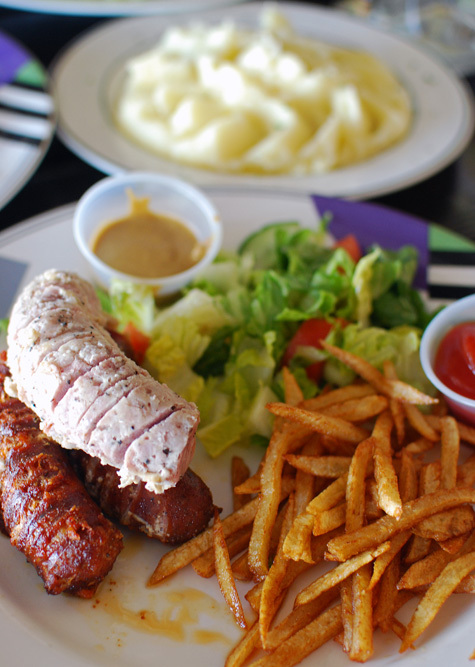 We tried the sausage combo, consisting of a white sausage (“slowly boiled coarse ground pork sausage, seasoned with a blend of spices created specially for Draft Barn”), a cheese sausage (“stuffed with imported German cheese”) and a Hungarian sausage (“smoked sausage, seasoned with Hungarian paprika”). All three were dry and mediocre, with the white one winning the Palm for both tasting and looking nasty. For a place that serves beer-friendly food, this is really sad. To add insult to injury, the “Home Style Mashed Potatoes” in the background were most likely a store-bought instant mix. 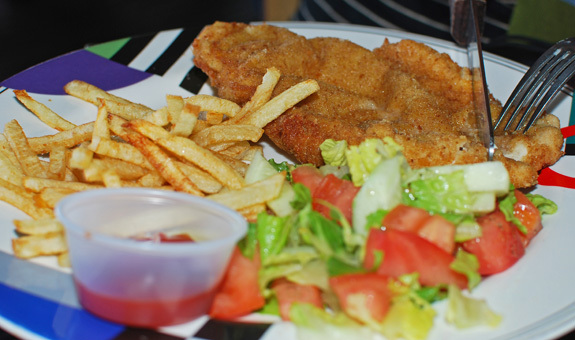 The chicken schnitzel was properly breaded but very bland — this was somewhat to be expected. 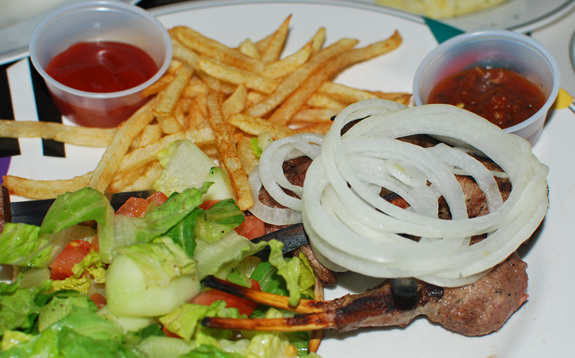 On the kebab front, the chalakhach was the lamb chops you can catch a glimpse of under the mountain of raw onion below. My request (both in Russian and English to maximize my chances) to have it done rare resulted in overcooked meat slightly less tough than a shoe sole. This really puzzles me: how can cooks serve burgers and steaks for a living and never have heard of meat cooked anything other than well done? There were no desserts on the menu, and it’s probably better that way.